When military, civilian, and business intelligence organizations rely on maps as an encyclopedic collection of facts (for inductive reasoning), instead using them as a medium that assists us to conceptually grasp the processes occurring within spatial systems (for deductive reasoning), they can be exposed to intentional or accidental manipulation. After I heard the news about the revolt of military analysts at the United States Central Command (USCENTCOM)—because they claimed that their reports have been altered by higher ups to fit the White House’s perceptions—my first question was “What about the maps in those reports; somebody had to be fixin’ spatial intel, too, in order to fit the agenda?” From my (modest) experience in reading intelligence reports and understanding the chain of command, I have little doubt that such has happened. Complementary maps are included in the documents for complementary, even esthetic, rather than analytical purposes. Usually political reference maps, created by third parties and widely used and recognized, they primarily serve as ornaments in intelligence papers and frequently support established myths (see Figure 1 below). In this context, the maps are not data around which a written analytical interpretation forms the document; rather, they are page fillers because someone said a paper should contain a reference map. Many analysts, within various ranks, seem to feel that the document needs a map, which is commendable. Yet they also make mistakes in not comprehensively articulating attached maps (in)significance and accuracy. Figure 1 (Source). Central Intelligence Agency’s ethnic (population distribution) map of Afghanistan from data collected in 1970s. 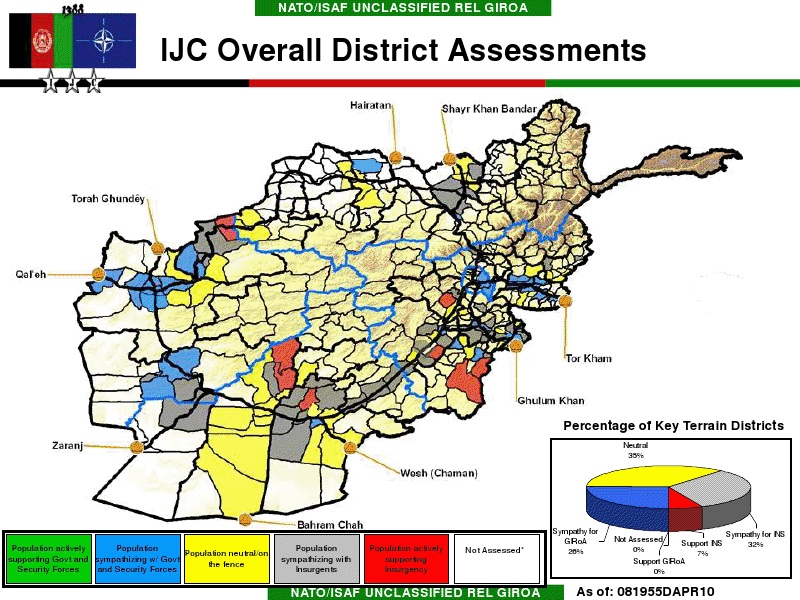 This map and similar versions were continuously used for years since the intervention in Afghanistan began in 2001. At the same time few questioned if it was appropriate to use it without addressing the rapid change in population growth, internal migration, and scale of urbanization (e.g., Kabul City alone has quadrupled in population since 2011). Too much information maps have the purpose of overwhelming the readers of reports or briefing audience who, from fear of looking confused and incapable of understanding what they are looking at, may not ask important questions about the information depicted on the map. These maps are particularly dangerous, because they move attention elsewhere and can prevent a dialog about vital matters. Such maps are created when an analyst wants too much information displayed on a single map—often against the cartographer’s advice—instead of creating a sequence of maps. Maps like that resemble the famous General McChrystal’s slide and are only good for one purpose—confusion. Sometimes that is the only purpose of such a product. Figure 2 (Source). Famous PowerPoint Slide that some map makers are seeing as a challenge they want to match. Forced information maps include data that the expert analyst did not want to be included for genuine specific reasons, but along the chain of command it becomes modified by non-experts who want to add something that fits their own agenda. For example, it can be as little as adding data points or changing categories of statistical data to modify geographic clusters and show that positive impact is higher than in reality. This is the most dangerous method in spatial manipulation of intelligence data and, I suspect, one of the points of contention within the CENTCOM’s intelligence wing. Figure 3 (Source). Imagine how easily a map like this can change by slightly modifying the values in an Excel spread sheet. Another category is maps presented and briefed by others without consulting with their original creator to provide guidance to a briefer. This happens frequently and is a form of manipulation by a person interpreting the data, rather than manipulation of data themselves. I recall a situation in Kabul, Afghanistan, when my colleagues and I published material using a simple, yet rather useful, map. It supported the narrative well, but it went beyond that; that part, however, had to be explained orally by an expert in a briefing setting. A few days later the paper was briefed to the ISAF Commander at the time, General Petraeus, by a person from another organization who was not on our team and never consulted us about the topic. His answers and explanations during the brief could have been better, to say the least, because he could not explain spatial relationships on the map. Every map is created to illustrate what its creator wants us to see and, for purpose of accuracy, has to be utilized in a specific context. The primary role of maps is to arrange the complexity of the real world into a meaningful visual whole (no map, however, due to its nature as a two-dimensional medium, is perfect!). They can be an incredibly powerful tool for illustrating and understanding issues. They can also be a manipulative tool to make us believe that the perception of reality in a combat zone is indeed the reality. That may have been an operational manner in which maps have helped fix the intel at CENTCOM as they moved along the chain of command.